Hazrat Maulana Nur-ud-Din wrote a book entitled Nur-ud-Din in refutation of a book Tark-i Islam (‘Leaving Islam’) written by a former Muslim who left Islam to become an Arya Samaj Hindu. In the book Tark-i Islam the author had listed a large number of objections against the Quran which, he said, were the cause of his leaving Islam. “(1) The Islam taught to us by that Scripture of human nature, the Holy Quran, does not say anywhere that Islam requires you to believe that Jesus had no father. (2) The Holy Prophet has not said that it is a part of Islam to believe that Jesus had no father. (3) Our beloved holy Companions, our four leaders of jurisprudence, and other great Imams, have nowhere instructed us that it is an essential of Islam to believe that Jesus had no father. (4) Our respected Sufi saints have not exhorted us anywhere in their teachings that, in Islam, to attain the ranks of Divine nearness, to accomplish self-reform, and to acquire noble morals, it is obligatory to believe that Jesus had no father. (5) Besides Jesus, there have been numerous prophets, messengers and appointed ones of Allah. Is the genealogy of any one of them recorded in the Holy Quran? In fact, Allah says, ‘None knows the hosts of thy Lord, except He’. So it is not necessary to know of the existence of everyone, let alone how they were born. This book, the full title of which is Nur-ud-Din bi-jawab Tark-i Islam, was published from Qadian in 1904. News of its publication was announced in Badr, 1 March 1904 (p. 8, foot of col. 3). In the book itself, the Hazrat Maulana writes on p. 184: “Today is 11th December 1903”. According to Badr, dated 24 February 1904, the name of this book as Nur-ud-Din was chosen by Hazrat Mirza Ghulam Ahmad (see p. 7, foot of col. 1). Sir Zafrullah appears to draw this conclusion from the Maulana’s words in the above quotation: “I myself, even though Islam is my faith and my life, held this view for a long time, but I do not hold it now.” But his conclusion is plainly and obviously wrong, as we show below. The objector gave it as a reason why he left Islam that, as a Muslim, he was required to believe that Jesus was born without needing to have a father. The Hazrat Maulana replied that there is no authority in Islam which requires a Muslim to hold this belief as a part of Islam. Therefore he asks the objector: how can you give it as a reason for leaving Islam? He goes on to say that this issue (whether Jesus was born without a father) is a matter to be determined by research and not on the basis of any religious doctrine. Now after telling the objector all this, it would be quite absurd for the Hazrat Maulana to add that he himself used to believe that Jesus had a father but now he holds that Jesus was born without a father. 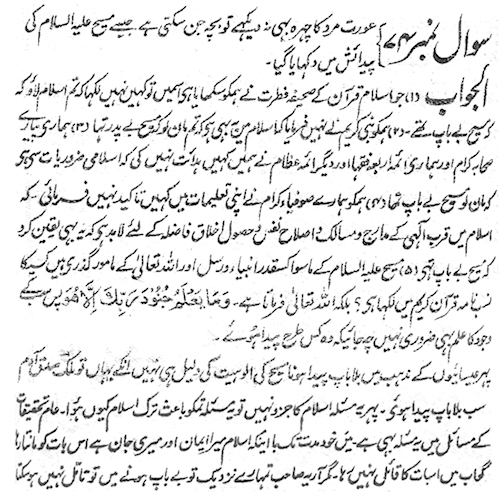 If the Qadiani Jama‘at conclusion is correct, it would mean that Hazrat Maulana Nur-ud-Din is saying that he no longer considers his points number (1) to (5) to be true. If so, then why is he putting them forward in the first place? And why does he not then say that he has now found such and such authorities in Islam which do require Muslims to believe as a part of Islam that Jesus had no father? On the other hand, the Qadiani Jama‘at may say that the Hazrat Maulana still regarded his points number (1) to (5) to be valid, but he had personally come to realize that Jesus had no father. But this means at least that, according to the Hazrat Maulana, it is allowed in Islam to hold the belief that Jesus had a father. Why then does the Qadiani Jama‘at constantly raise it as an objection that the Lahore Ahmadiyya Jama‘at holds the belief that Jesus had a father? The meaning of the Hazrat Maulana’s words “I myself, even though Islam is my faith and my life, held this view for a long time, but I do not hold it now” is, in fact, the opposite of what the Qadiani Jama‘at has suggested. He clearly means that he used to believe that Jesus was born without a father, the belief which has driven the objector out of Islam, and that he saw no inconsistency in holding this belief with being a Muslim, but he does not hold this belief now. Despite Islam being his faith and his life, he has come to believe that Jesus did have a father. It is clear from this again that the view of Hazrat Maulana Nur-ud-Din is that Islam does not require Muslims to believe that Jesus was born without a father.